Contractors and maintenance pros gather at annual event to share ideas and learn from each other. A serious shortage of salt this winter means prices are expected to rise. Prepare your business and customers now. A change in market forces means an impact to consumers of road salt. In early August, one of our members showed me an email he received from a major salt mine. It simply said that due to an unforeseen strike in the summer, coupled with contractual obligations to municipalities there will be no salt supply for private contractors this winter. This has sent distributors and contractors scrambling to find salt. It is disappointing that even though Sifto (Compass Minerals) in Goderich, Ont., is the largest salt mine in the world, private contractors will have to source salt from elsewhere. Salt for private contractors will probably be coming from Chile, Morocco or Egypt. This means prices will probably go up because of short supply and additional transportation costs. A number of larger salt users are considering bringing in their own supply from different parts of the world, however, the upfront cash required and the sheer logistics (unloading, storage and distribution) are daunting for the inexperienced. I have been told that the main suppliers to our trade have been able to find alternative sources, but the cost will be 30 to 50 per cent more than last year. Talk to your supplier to understand what their situation is. If you are supplied directly by the mines, you will have to find alternative salt suppliers. Incorporate liquids and other alternatives, such as beet juice. Although this is not the complete answer, it will help reduce the amount of salt required. Operate more efficiently. Don’t over-salt. There are even some court cases where people have slipped on excessive salt. There is a huge opportunity to reduce salt use without compromising safety. Consider mixing the salt you do have with sand. Let your customers know. It is much better to be transparent with them. Work together to find ways to reduce salt use by identifying underused parking lots or areas that are not a priority. Protect yourself contractually. The Landscape Ontario Standard Form Snow Maintenance Contract contains clauses that protect you from situations where there is scarcity of supply or increased costs. See HortTrades.com/snow-contracts. Register for the Snowposium on Sept. 25 where you can speak to suppliers and fellow contractors to find out what they are doing about the situation. Properly calibrate your equipment. This can save you up to 35 per cent. Secure your salt supply as soon as you can. In the Joni Mitchell song, Big Yellow Taxi, the lyric says: “They paved paradise and put up a parking lot.” In one of Bruce Cockburn’s songs, he says, “If you stare at too much concrete, you forget the earth is alive.” Last month, we created a little piece of paradise at Yonge and Bloor Street in Toronto when the street was shut down. Members helped to create a pop-up park overtop of the concrete, and the public loved it. Children were playing, old folks were walking and yoga enthusiasts were exercising on the grass. There was no doubt that what we do for a living makes cities more liveable and improves the quality of life for everyone. Thank you to Fairgreen Sod Farms, Market Supply, Urban Garden and Sheridan Nurseries, who together with the City of Toronto, Open Streets Toronto, Landscape Ontario and Come Alive Outside for taking a parking lot and transforming it into a park. Those of you who know me know that I am not a golfer. I don’t own golf clubs, nor do I know what a birdie or a bogey is. 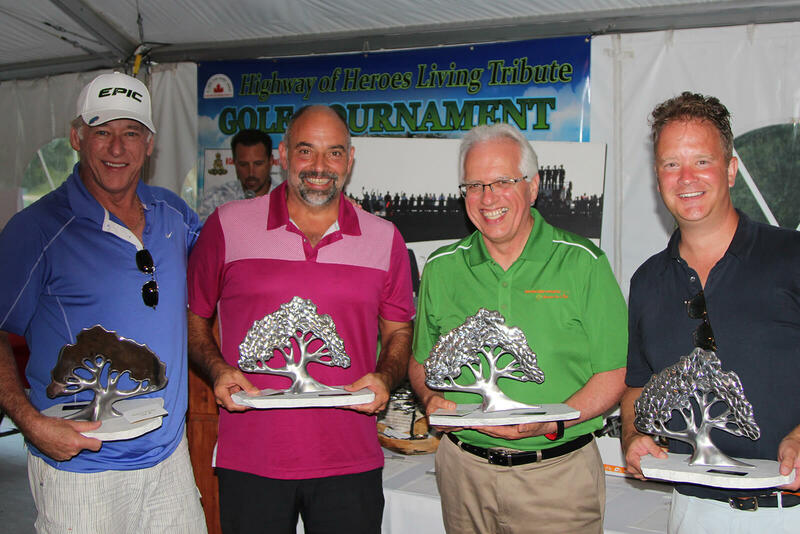 Yet at the Highway of Heroes Living Tribute golf tournament last month, I was part of the winning foursome. This was simply because I was in the company of three amazing golfers — the best one being my son-in-law, Craig Stovel. As I reluctantly posed for the victory picture, Dave Turnbull turned to me and said, “That is the story of your life… you surround yourself with great people.” David could not be more correct. I have always been fortunate to be in the company of wonderful, talented, creative, dedicated and committed staff and members. Thank you for making me look good! The HOHLT tournament raised $112,000 thanks to the generosity of many golfers and sponsors. An anonymous donor also agreed to match all of the funds raised. So far, we have raised $3.5 million of our $10 million goal. The winning foursome: Paul Rosenberg, Joe Morello, Tony DiGiovanni and Craig Stovel. Tony DiGiovanni may be reached at tony@landscapeontario.com.